Chris Sheppard will be auctioning one of his Santa Cruz Stigmata 'Cross bikes to help fund two junior cyclocross racers' trips to the 2008 World Championships, which will take place in Treviso, Italy, on January 26th and 27th. Cyclo-cross is a challenging sport that is hard on both equipment and wallet. Due to its non-Olympic status, 'Cross funding is limited, if not non-existent for juniors. "I won the '91 junior Canadian XC championships, which entitled me to a position on the National Team. If it were not for two generous mountain biking lawyers (Frank Quinn, Russ Candari - thanks again) I would not have been given an opportunity to chase my dream," noted Sheppard. Along with a completely built 1300gr Stigmata frame, the winner will receive a Giro kit consisting of a Pneumo helmet and two bib short/jersey sets. Onboard equipment includes: Chris King headset, SRAM Force drivetrain, Crank Brothers pedals, Paul brakes, Alpha-Q forks and Dt-Swiss wheels. 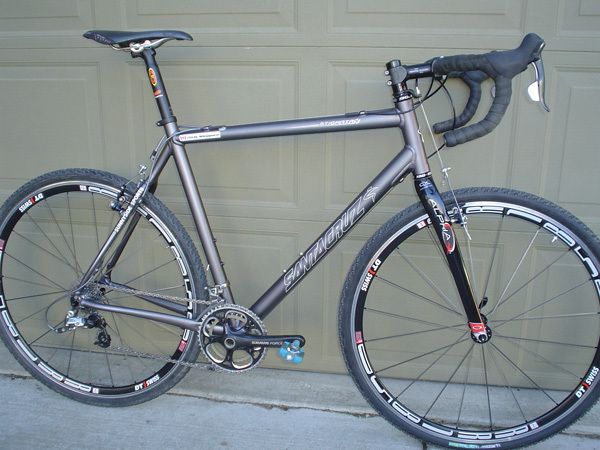 The bike will be fully prepped and buffed out prior to shipping by Sunnyside Sports in Bend, Oregon. Sheppard resumed competition at the US Grand Prix of Cyclocross in Trenton this past weekend (finishing 11th) followed by the Series Final in Portland, Oregon, December 1st and 2nd. Please check out www.santacruzbicycles.com for updates on the forthcoming E-Bay auction!